Hawaiian Jewelry Catalog: Box Chain - Solid 14 carat Yellow Gold - 40cm - 16"
#BOX14KYELL16. 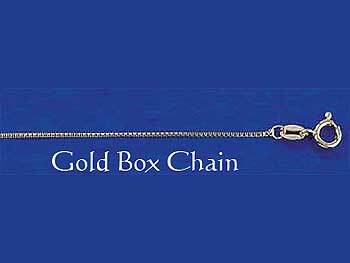 Box Chain - Solid 14 carat Yellow Gold - 40cm - 16"
Solid 14 carat Yellow Gold Box chain, beautifully finished. Secured with bolt ring clasp. Measurements: 40cm (16 inches). 0.6mm diameter. Weight 1.00 gram. Also available in Rose and White Gold. (Rose gold only available in 40cm & 45cm).